President Donald Trump’s attempt last week to override his own administration's newly announced sanctions targeting North Korea -- and later efforts by the White House to clarify his position — were part of an attempt to clean up a rogue tweet by the commander in chief, sources familiar with the matter told ABC News. On Friday, via Twitter, Trump announced he was canceling sanctions that his administration announced with fanfare the day prior against two Chinese shipping companies that were circumventing sanctions on North Korea. The tweet sent members of his national security and Treasury staff scrambling to understand — and explain — his apparent reversal of what had been a carefully orchestrated policy rollout, which included a briefing by a senior administration official, who touted the actions as necessary for maintaining the current sanctions package, and sending a message to sanctions violators that they would be held accountable. 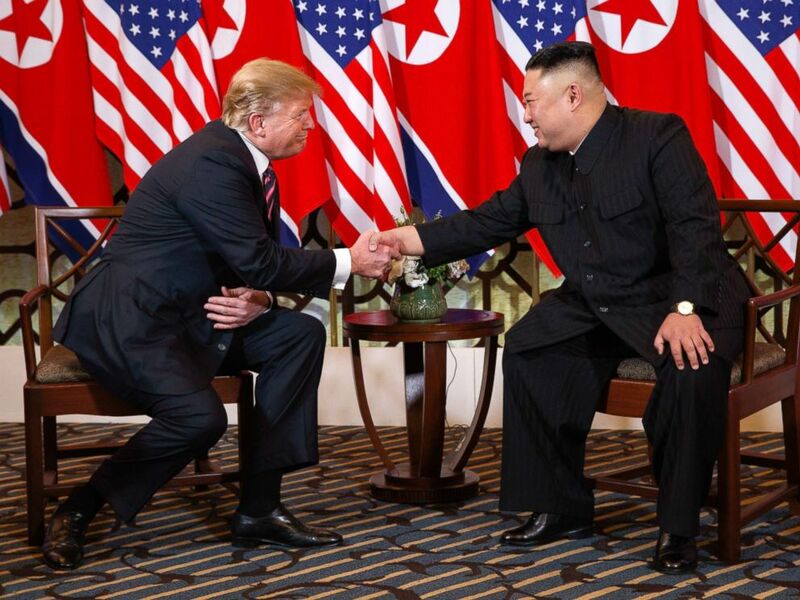 President Donald Trump meets North Korean leader Kim Jong Un, Feb. 27, 2019, in Hanoi. The president appeared confused in the tweet, because no new sanctions had been announced that day. But, his reference to the sanctions announced a day earlier was clear, and White House press secretary Sarah Sanders soon followed up with a statement affirming the president’s tweet. "President Trump likes Chairman Kim and he doesn’t think these sanctions will be necessary," Sanders said in the statement. In her statement, she made no suggestion that the president was talking about anything other than the sanctions announced Thursday, which were the only publicly announced actions against North Korea. But, then later Friday night, the administration — through an official demanding total anonymity — issued new guidance that claimed the president actually was talking about sanctions that had yet to be announced and indicating that no additional sanctions would be pursued at this time. The anonymous administration official said the sanctions announced on Thursday would go into effect after all. But, sources familiar with the matter told ABC News that the president did mean to target those sanctions that had been announced, and as his staff scrambled to respond, he had to be convinced not to retract the sanctions. Ultimately, the administration reaffirmed that the sanctions announced Thursday would take effect as planned. Sanders said as much on Monday, without acknowledging the president's attempted reversal or her previous statement doubling down on the president's surprise tweet. "The sanctions that were in place before are certainly still on, they are very tough sanctions, the president just doesn't feel it's necessary to add additional sanctions at this time, nothing else to add," Sanders told reports. "Like I said, the president likes him, they want to continue to negotiate and see what happens," Sanders said, referencing Kim, when a reporter pressed for more on the president's reasoning. Sanders declined to provide any additional comment to this story, other than to point to her Monday comments.